The village of Bento Rodrigues after the disaster. The Mariana dam disaster, also known as the Bento Rodrigues dam disaster and Samarco dam disaster, occurred on 5 November 2015, when an iron ore tailings dam in Mariana, Minas Gerais, Brazil, suffered a catastrophic failure, resulting in flooding that destroyed the village of Bento Rodrigues and killed 19 people. The failure of the dam has been described as the worst environmental disaster in Brazil's history. Around 60 million cubic meters of iron waste flowed into the Doce River, causing toxic brown mudflows to pollute the river and beaches near the mouth when they reached the Atlantic Ocean 17 days later. The disaster created a humanitarian crisis as hundreds were displaced and cities along the Doce River suffered water shortages. The total impact of the disaster, including the reason for failure and the environmental consequences, are officially under investigation and remain unclear. The owner of the Bento Rodrigues dam, Samarco, was subject to extensive litigation and government sanctions. In 2016, charges of manslaughter and environmental damage were filed against 21 executives, including Samarco’s former CEO and representatives from Samarco’s owners, Vale and BHP Billiton, on its board of directors. Controversy over the investigation grew after a 2013 report, indicating structural issues in the dam, was leaked. The Fundão and Santarém tailings dams were constructed and owned by Samarco Mineração SA, a mining company, in Mariana, a municipality 67 kilometers (42 mi) south-east of Belo Horizonte, in the state of Minas Gerais, Brazil. The tailings dams were built by Samarco to accommodate the waste resulting from the extraction of iron ore taken from extensive Germano mine, located in the Mariana district of Santa Rita Durão. The Fundão dam was constructed in the hills near the village and subdistrict of Bento Rodrigues, located 14 kilometers (8.7 mi) north of Mariana city. At approximately 3:30pm on 5 November 2015, the Fundão dam began to leak. Immediately, a team of outsourced employees was sent to the scene, and they tried to mitigate the leak by deflating part of the reservoir. At around 4:20pm, a rupture occurred, releasing a large volume of toxic sludge into the Santarém river valley. Bento Rodrigues, which lies 2.5 kilometers (1.6 mi) away in the valley below the dam, was almost entirely flooded by the cascade of toxic water and mud. Other villages and districts in the Gualaxo river valley, also in the region of Mariana, suffered minor damage. Bento Rodrigues is only accessible by unpaved back roads. The incident rendered Bento Rodrigues completely inaccessible by road, hindering firefighters' rescue efforts. The only available method of transport into or out of the location was via helicopter. There was a school in the area where the flood occurred, and the teachers were able to remove the students before school. Samarco and the neighboring communities did not have a contingency plan or evacuation routes in the event of dam failure. Had such plans existed, residents may have been able to evacuate in a timely manner to more secure regions. Around 600 people were evacuated to Mariana, and troops of the Brazilian Armed Forces were deployed to assist. 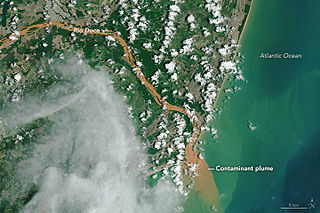 Satellite images of Bento Rodrigues and the Germano mine before and after the disaster, displaying the flooding and pollution of the Doce River. An abandoned car caught in the mudslide amidst the ruins of Bento Rodrigues. Satellite image of the mouth of the Doce River in Linhares, Espírito Santo, when tailings reached the southern Atlantic Ocean. According to a United Nations report, the tailing slurry traveled 620 km downriver, eventually reaching the Atlantic Ocean. Nineteen people were killed, "Entire fish populations – at least 11 tons – were killed immediately when the slurry buried them or clogged their gills", and "the force of the mudflow destroyed 1 469 hectares of riparian forest." At around 6:30pm on the day of 5 November, the tailings of iron ore reached the Rio Doce. The river basin has a drainage area of about 86,715 square kilometers, with 86% in Minas Gerais and Espírito Santo. In total, the river covers 230 municipalities that use its bed for subsistence. According to biologist and ecologist Andrew Ruschi, who studies marine biology at the Estação Biologia Marinha Augusto Ruschi in Santa Cruz, Espírito Santo, the waste will take at least decades to dilute to levels anywhere near previous levels. The waste also reached the hydroelectric power plant of Risoleta Neves in Santa Cruz do Escalvado within 100 kilometers of Mariana. According to the company that runs the power plant, its functioning has not been affected. On 9 November, the city of Governador Valadares stopped the water intakes due to the mud on the Rio Doce. The next day, a State of Public Calamity was decreed in response to the water shortage in the city. According to analyses carried out in the city, the mud contains greater than acceptable concentrations of heavy metals, substances harmful to health, such as arsenic, lead and mercury. There are concerns about contamination of the nearby Rio Gualaxo do Norte [pt], a tributary of the Doce River, due to the toxic substances stored at the facility. On 22 November, the waste reached the Atlantic Ocean. The toxic mud is spreading across the Espírito Santo coast, where cities closed down access to beaches. On 7 January 2016, the waste reached the southern Bahia littoral zone. Environmentalists[who?] are monitoring the impact to the Abrolhos Marine National Park wildlife. The park is considered of vital importance to the Brazilian ecosystem since it hosts the greatest marine biodiversity in the whole southern Atlantic ocean. On the first quarter of November 2015, the Brazilian Chamber of Deputies and the state chambers of Minas Gerais and Espírito Santo each created a special commission to follow the case, and the actions taken. According to the press, many of the deputies that composed such commissions had received donations from Vale to finance their campaigns. Such donations, summing up to R$2.6 million are legal, and were reported by the then-candidates to the Brazilian Election Justice. However, critics argued that the deputies' participation was clearly biased. In January 2016, the leaking of internal documents from 14 months before the disaster revealed that Samarco had been warned about the possibility of the dam collapses. Joaquim Pimenta de Ávila, an engineer who was regarded as one of the foremost tailing dam engineers in Brazil, had been contracted by Samarco between 2008 and 2012 to design and oversee the construction of the Fundão dam. From 2013, Ávila was hired part-time as a consultant to inspect the dam, and a technical report he wrote from September 2014 lists severe structural problems on the dam (in the form of cracks) and measures to mitigate them, the main one being the construction of a buttress. Samarco claimed to have implemented all the recommendations from Ávila, and that the dam was in the process of being heightened when the landfill reached its maximum holding capacity and began to leak. However, Samarco failed to comment specifically about the buttress, and claims that it was never warned about the severity of the structural damages, nor about the imminence of a catastrophic failure. The Minas Gerais government suspended Samarco's activities immediately after the disaster. Next, the Brazilian government fined Samarco R$250 million (USD$66.3million) for the incident. The fine was preliminary and was expected to be increased if the two companies were found guilty of water pollution and damages. In January 2016, the Brazilian government and Samarco reached an agreement and a fine of R$20 billion (USD$4.8 billion) was issued. The penalty did not include compensation to people affected by the disaster, and the cost of recovering the polluted area. By July 2016, BHP had provisioned USD$2.3-2.5 billion for costs associated with the compensation deal being struck between Samarco's shareholders (BHP and Vale) and Brazilian federal, state and municipal authorities. Vale and BHP Billiton own Samarco as a joint venture, with each company possessing a 50% stake. As of 2018, these companies remain in negotiations with Brazilian authorities in efforts to settle out of court. In March 2016, Samarco agreed to pay USD$2.3 billion in compensation. Australia's ABC reported that Samarco and its joint venture partners would "establish a foundation to develop and execute environmental and socio-economic programs to restore the environment, local communities and social conditions of the affected areas." In June 2016, an AUD$8 billion civil suit which was reinstated by Brazil's Superior Court after the original agreement was suspended. BHP, along with its Samarco joint venture partner Vale, face a separate $58 billion suit lodged by federal prosecutors. In October 2016 it was reported that Brazilian prosecutors had filed manslaughter and environmental charges against 21 people including top executives of Samarco's owners: BHP Billiton, an Anglo-Australian multinational mining, metals and petroleum company headquartered in Melbourne, Australia and the world's largest mining company, and Vale SA, the third-largest mining company in the world and the Public Eye People's Worst Company award winner of 2012. In June 2018, Samarco, Vale and BHP signed a deal to drop a $7 billion lawsuit and allow two years for the companies to address the greater $58 billion suit seeking social, environmental and economic compensation. In August 2018, BHP settled a class action suit in the USA for USD$50 million, with no admission of liability. At the same time, it was facing a class action suit in Australia related to the dam failure and losses incurred by shareholders following company disclosures to the market regarding the safety of the dam. The class action is expected to be one of the largest in Australian history, with 30,000 BHP shareholders involved, with a combined shareholding of 330,000 shares, valued at over AUD$10 billion (as of 5 November 2018). On 5 November 2018, SPG Law, a Liverpool-based law firm, issued a class action against the BHP Group for £5 billion, one of the largest in British legal history. The city immediately began a campaign to collect donations for the homeless, stressing the urgent need for donations of toothbrushes, towels, glasses, cutlery, disposable dishes and especially drinking water. Also a bank account was opened to receive cash donations. All municipal events since the day of the disaster until 16 November were canceled. The note from the Mayor's Office said that "at this point, the city of Mariana is focused on rescue work and support". The Federal Government, through the Minister's Chief of Staff, Jaques Wagner, put the Federal forces at the disposal of the State of Minas Gerais. The Minister came into contact with the Governor, Fernando Pimentel, to put the Federal forces. Jaques Wagner announced President Dilma Rousseff on accident before loading it back from a trip to Brazil to Brasília. The Roman Catholic Archdiocese of Mariana said: "We express our most heartfelt sympathy to the families who have had their homes and property destroyed and those who mourn the death of their loved ones, victims of this disaster of incalculable proportions. The point is to unite efforts to minimise the distress and suffering of all those affected by this tragedy. We call upon our communities to provide support to victims. [...]. We pray to God to strengthen and comfort, with your generous love, all who have been affected by this accident". The Diocese of Itabira and Three Lakes and the East Regional II CNBB, comprising the territories of the States of Minas Gerais and Espírito Santo, also issued notes of solidarity with those affected by tragedy. A football match between Cruzeiro and São Paulo on 8 November in Belo Horizonte hosted a collection of resources to help the victims. A report by experts of the United Nations contradicted repeated statements by the Brazilian government and the involved mining companies that the released chemicals were harmless. Instead, the report indicated that the released mud contained high levels of toxic heavy metals and other toxic chemicals and also criticized the slow release of information. Although heavy metals were found, the difference in concentration was found not to differ significantly from that found in the 2010 geologic survey. The report said the tailings that entered the Rio Doce were composed of clay and silt from the processing of earth containing iron ore, which is naturally abundant in the region. The French spokesman for the Ministry of Foreign Affairs, and Romain Nadal expressed their condolences. A spokesman commented: "We were told with emotion of the disruption of the mining dams in the State of Minas Gerais in the Southeast region". American band Pearl Jam, who performed in Belo Horizonte on 20 November, promised to donate the proceeds of the concert to victims of the disaster. Singer Eddie Vedder also gave a speech calling for harsh punishments to be applied to Samarco and others involved. 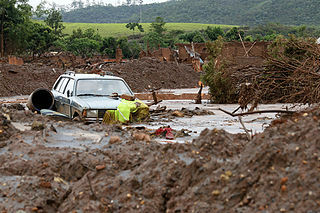 ^ a b c d e "Dam burst at mining site devastates Brazilian town". Al Jazeera English. AFP and Reuters. 6 November 2015. Retrieved 6 November 2015. ^ a b "Brazil dam burst: Six months on, the marks left by sea of sludge". BBC. 5 May 2016. ^ a b c Willis, Andrew; Stringer, David (7 November 2015). "Dam Owned by Iron-Ore Giants Bursts, Flooding Brazil Valley". Bloomberg. Retrieved 7 November 2015. ^ "Boechat: Mariana é a maior tragédia ambiental do Brasil". TV UOL (in Portuguese). 9 November 2015. Retrieved 30 November 2015. ^ "Acidente na barragem de Samarco é "a maior tragédia ambiental" do Brasil". Rede Angola (in Portuguese). 21 November 2015. Retrieved 30 November 2015. ^ "Sebastião Salgado: "É a maior tragédia ambiental do Brasil. Mas tem solução"". El País (in Portuguese). 19 November 2015. Retrieved 30 November 2015. ^ Rifai, Ryan (22 November 2015). "Toxic sludge reaches Atlantic after Brazil dams burst". Al Jazeera. Retrieved 30 November 2015. ^ "Anger rises as Brazilian mine disaster threatens river and sea with toxic mud". London: The Guardian. 22 November 2015. Retrieved 24 December 2015. ^ Dunckley, Mathew (13 November 2015). "BHP Billiton rebuts Samarco dam report". The Sydney Morning Herald. Retrieved 13 November 2015. ^ Phillips, Dom (25 November 2015). "Brazil's mining tragedy: was it a preventable disaster?". London: The Guardian. Retrieved 24 December 2015. ^ Phillips, Dom; Brasileiro, Davilson (1 March 2018). "Brazil dam disaster: firm knew of potential impact months in advance". The Guardian. London. Retrieved 2 April 2019. ^ Timson, Lia (4 March 2019). "'Profit before people': documents allege BHP execs were warned over deadly dam". Sydney Morning Herald. Retrieved 2 April 2019. ^ United Nations, Mine tailings storage: Safety is no accident, Report summary , circa 2015. Accessed June 2018. ^ "Arsenic and mercury found in river days after Brazil dam burst". London: The Guardian. 25 November 2015. Retrieved 8 August 2017. ^ "Samarco mine tragedy: Toxic mud from Brazil mine spill reaches Atlantic Ocean". ABC News. Australian Broadcasting Corporation. 22 November 2015. Retrieved 30 November 2015. ^ Hédio Júnior (7 January 2016). "Sinais de lama chegam à Bahia, perto de Abrolhos e Trancoso; Ibama notifica Samarco" [Remains of mud reach Bahia near Abrolhos and Trancoso; Ibana notifies Samarco] (in Portuguese). Estado de Minas. Retrieved 8 January 2016. ^ "Parque Nacional Marinho dos Abrolhos" [Abrolhos Marine National Park] (in Portuguese). Brazilian Ministry of Tourism. Retrieved 8 January 2016. ^ "Vale doou à metade dos deputados da Comissão do Rio Doce. Empresa doou R$388,7 mil para os deputados estaduais da Comissão" [Vale has donated to half of the deputies of the commission] (in Portuguese). G1. 9 November 2015. ^ Paul Kiernan (17 January 2016). "Samarco Warned of Problems at Dam, Engineer Says". The Wall Street Journal. Retrieved 22 January 2016. ^ "Brazil mining company Samarco suspended over dams burst". BBC News. British Broadcasting Corporation. 9 November 2015. Retrieved 11 November 2015. ^ "Vale and BHP fined for deadly Brazilian dam burst". BBC News. British Broadcasting Corporation. 13 November 2015. Retrieved 13 November 2015. ^ "Eine schlammbraun gewordene Lebensader" [A mud brown become lifeline] (in German). 27 November 2015. Retrieved 30 November 2015. ^ "Samarco, Brazil move closer on $4.8B dam-disaster settlement". CNBC. 22 January 2016. Retrieved 22 January 2016. ^ a b "BHP Billiton's Samarco costs top $3 billion". ABC News. 28 July 2016. Retrieved 7 November 2018. ^ "Mining giants face homicide charges over Brazil dam disaster". RT. 21 October 2016. Retrieved 23 October 2016. ^ "BHP-owned Samarco agrees to pay Brazil Government $3.2 billion for dam collapse". ABC News. 3 March 2016. Retrieved 7 November 2018. ^ "Samarco staff and BHP executives charged with homicide over Brazil dam spill". ABC News. 21 October 2016. Retrieved 7 November 2018. ^ Rapoza, Kenneth (30 January 2012). "'Worst Company In The World' Award Goes To..." Forbes. Retrieved 30 November 2015. ^ "BHP signs deal to suspend $55b Samarco lawsuit for two years". ABC News. 26 June 2018. Retrieved 7 November 2018. ^ "BHP to settle US Samarco class action for $US50m - Australian Mining". Australian Mining. 9 August 2018. Retrieved 7 November 2018. ^ Editorial, Reuters. "BHP says Brazil court approves Samarco settlement". U.S. Retrieved 7 November 2018. ^ Danckert, Sarah (29 October 2018). "BHP class action heats up as 30,000 shareholders sign up". The Sydney Morning Herald. Retrieved 7 November 2018. ^ Editorial, Globe Newswire (5 November 2018). "SPG Law bring claim in Liverpool against BHP Billiton for victims of Bento Rodrigues dam disaster". Retrieved 10 November 2018. ^ "Prefeitura de Mariana :: Comunicado sobre as doações de donativos" (in Portuguese). Prefeitura Municipal de Mariana. Archived from the original on 9 November 2015. Retrieved 13 November 2015. ^ "Governo garante apoio à cidade mineira de Mariana, inundada por lama após rompimento de barragens". Portal Brasil (in Portuguese). Retrieved 13 November 2015. ^ "Cruzeiro arrecadará doações para vítimas de tragédia em Mariana". O Tempo (in Portuguese). Belo Horizonte. 6 November 2015. Retrieved 30 November 2015. ^ a b Paul Kiernan (25 November 2015). "Brazil Dam's Failure Flooded Region With Toxic Waste, U.N. Report Says". The Wall Street Journal. Retrieved 27 November 2015. ^ Stephen Letts (26 November 2015). "BHP Billiton denies UN claims Brazil dam disaster mud is 'toxic', damage size of 20,000 Olympic pools". Australian Broadcasting Corporation. Retrieved 28 September 2017. ^ "Pearl Jam Calls for Justice in Mariana and Promises to Donate Revenue from Tickets to Victims". Folha de S.Paulo. 23 November 2015. Retrieved 30 November 2015. Wikimedia Commons has media related to Bento Rodrigues dam disaster. This page was last edited on 18 April 2019, at 03:50 (UTC).